In celebration of San Antonio’s 300th anniversary the McNay has organized a series of exhibitions of drawings from Captain Seth Eastman’s sketchbook which chronicled his trip to Texas in 1848-49. The first two installments followed Eastman down the Mississippi to New Orleans and the Gulf of Mexico. The third, titled The Trip to San Antonio, featured his most famous drawings of the San Antonio missions, including the Alamo. The fourth, and last, of the series takes us to the Hill Country and the important German settlement of Fredericksburg. The most compelling of these drawings show Eastman’s campsites amidst the immediately recognizable shrub-dotted hills and live oaks of the Texas Hill Country landscape. Others depict the houses of the German settlers which Eastman confusingly refers to as “Dutch,” a word commonly used in the nineteenth century to refer to anyone or anything from a Germanic country or region. Captain Eastman’s sketchbook is one of the great historical works in the McNay’s collection. This is the first time in years that so many of the drawings will have been on view. An interactive map in the gallery will enable visitors to follow Eastman’s journey using excerpts from his journal as well as historical and modern-day photos of locations he sketched. For press-approved images, please click here. This exhibition is organized by Lyle Williams, Curator of Prints and Drawings, for the McNay Art Museum. Lead funding is most generously given by the Elizabeth Huth Coates Exhibition Endowment and the Arthur and Jane Stieren Fund for Exhibitions. 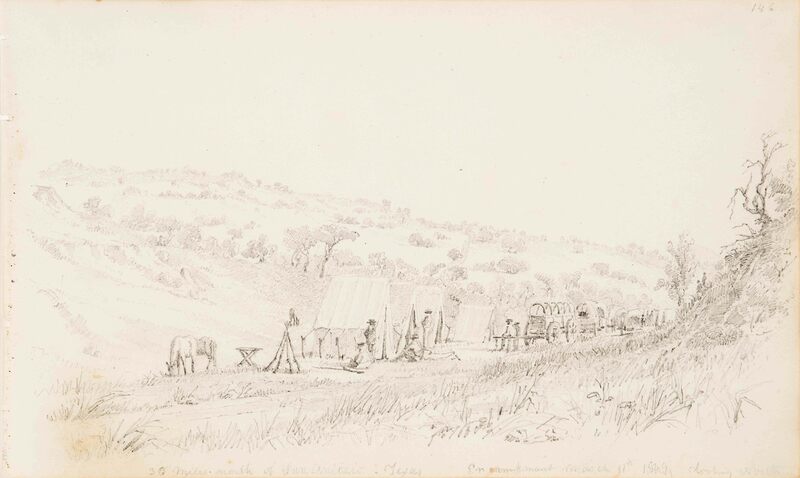 Seth Eastman, Encampment, 30 Miles North of San Antonio, Texas, March 1849, from Sketchbook, 1848-49. Graphite on paper. Collection of the McNay Art Museum, Gift of the Pearl Brewing Company, 1961.5.118.